In order to create and maintain a favorable microclimate at any time of the year, significantly reduce the cost of heating, as well as save the budget for paying bills for heat, it is necessary to prepare the premises for cold weather in advance and to exclude the possibility of heat loss. Therefore, a decision in choosing the method of rendering should be made. Vitaliti Contractors LTD specialists will help you in this process and suggest the most suitable options as well as select the necessary materials individually for your project. In general, the insulation is produced in the mansards, under the floors, in the basements, facades, under the roof, ductworks and water pipes. Two methods of insulation can be classified depending on the side where the work will be done: internal and external rendering. It is very important to choose materials correctly, as well as to follow the technology of their laying. The method of internal rendering is less expensive compared to the external method of insulation. In addition, it can be connected with the general repair of the premises. In this case, insulation of the room will be a perfect solution. However, along with the advantage of saving money, there is a significant drawback of internal insulation - it is the loss of space in the room, as well as the risk of damaging the electrical wiring during the work process. One more disadvantage of internal rendering is that it could take up to a week for the process to be completed depending on the space of the premises, and that means that house residents will be living within a building site during that period of time. This method is more energy efficient. More heat remains inside the premises with its help. Also, it is much more convenient for residents of a apartment building to make external insulation, as the entire construction process takes place outside the premises. This method of insulation is more expensive, but in general it is more convenient for residents. In addition, a choice of aesthetic design is possible, and the thickness of the insulating overlap doesn’t absorb the useful space inside the room. 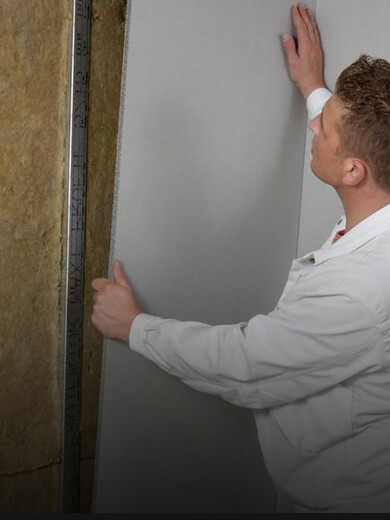 Knauf Insulation is a reliable high quality insulation material by the German company Knauf, which has a minimum thermal conductivity. It is produced from environmentally friendly materials by a specially developed innovative technology. The quality thermal insulation issue is always topical for country houses, cottages and chalets, as well as for industrial buildings. In this case the first-class insulation will perfectly affect the financial savings of the budget due to the fact that such types of buildings have a large area and heat loss accordingly. It can be installed in floor structures, in pitched roofs, in attic and interfloor ceilings, in frame structures of walls inside premises, and also as a layer of soundproofing in interior partitions. Knauf Insulation has good heat and sound-insulating undoubted qualities, has no smell, also it is a non-combustible material resistant to insects and rodents. There are no synthetic additives and resins in its composition. In addition, the manufacturer guarantees the quality of products up to 50 years. Thus, rendering of premises requires less energy for heating in winter and reduces air conditioning cost of cooling in summer. Therefore, good thermal insulation will save your budget at any time of the year.